Visit any park in China between the hours of 6:00 – 9:00 and you will see 100s of people of all ages and physical conditions doing all kinds of exercises. Most of us are familiar with a few taijiquan and qigong systems which is only a small part of what you can see in these many parks in every Chinese town and city. From the recognisable taiji and qigong routines to ballroom dancing and aerobics the incredible range of physical activities illustrates the many approaches taken to maintaining physical and mental well-being. This short film was put together by Ronnie Robinson following a visit to China in 2010. 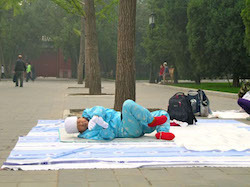 The park is Ditan Park in Beijing.